- How bright should my sub-frames be? Since there's no histogram display it's hard to tell if I'm over or underexposing. - If my subs are too dark, should I increase ISO or decrease shutter speed? Does it matter which one I choose? Will increasing the ISO increase noise, will decreasing shutter speed increase motion blur, or are these parameters merely virtual (ie live view is updated at a constant 30fps by the camera, ISO is just a gain value) and they both have the same effect to increase the signal (and noise) equally? - Has anyone experimented with different USB2 (or USB3) cables to improve fps throughput to the computer? It is possible to buy "high quality" USB2 cables with extra shielding, gold plated connectors, thicker wires etc, has anyone tried these and has it made any difference? It's a trial and error for ISO versus shutter speed. However, for planetary make sure you use 5x zoom. This gives you in most cases a 1:1 pixel resolution, meaning 1 pixel on the sensor = 1 pixel on your image. It is the best resolution you can get in planetary mode. Your camera is a USB2 camera, so a USB3 cable won't do anything to increase throughput. Your "best settings" and my "best settings" will likely not be the same. In LiveView both the shutter and ISO control the brightness. I would suggest setting the ISO at 400 and vary the shutter speed to control the brightness. It will take some trial and error to get the a well exposed planetary image and it may vary from night to night, but the viewed LiveView image should appear somewhat underexposed. You can brighten it to your taste by stretching it during processing. Thanks for you responses, I'm aware that there are no "best" settings, it will depend on the target, atmosphere, camera etc etc. I guess I was more interested if anyone knew how LiveView works exactly so I can optimise one setting (ISO vs shutter speed) over another for best results. 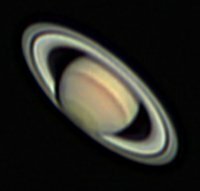 I was able to turn 2000 underexposed, blurry, grainy sub-frames of Saturn into a pretty good result from my 6" SCT (see images attached), just wondering if I can do better. 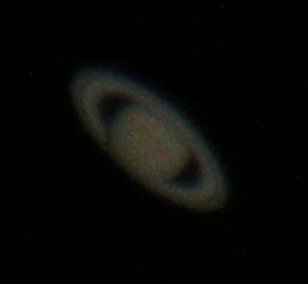 That is a very good Saturn image, probably about the best you can expect from a 6" SCT. You can clearly see the Cloud-top Banding, and the Rings show Details including the A & B Rings and the Cassini Division!! Given the limited Aperture and the Central Obstruction, that's Very Good!! Hi there, thanks for your comment. It's no real secret how to turn these sub-frame images into the photos you see on the web. After waiting for a cloudless night, I set up my Celestron 6" SCT to track Saturn. I used BYEOS to take 2000 jpg images (sub-frames) of the planet in planetary mode with my Canon 700D, using a 2x Barlow lens and 5X Liveview zoom. I then stacked the best frames (I found 50% worked best for these subs) in AutoStakkert, and then used Registax to sharpen and de-noise the image. A little brightening, de-noising and colour saturation in Photoshop Elements (but not too much 😃) got me the final result. I must admit that I was absolutely amazed with the final image, especially considering what the original images looked like. There is a great workflow on the web here, note that he uses a mono camera and multiple filters, I find a DSLR camera works just fine. I also don't use WinJupos, AutoStakkert has a derotation mode that seems to work OK.